The Doctor was first, albeit very briefly, activated as a demonstration by Vice Admiral Patterson for Captain Janeway shortly before Voyager's launch on stardate 48038.5 in early 2371. On stardate 48308.2, The Doctor was activated by Ensign Harry Kim to help treat crew members injured in the ship's violent transit to the Delta Quadrant, during which the assigned medical staff had been killed. The Doctor quickly established that the Voyager crew would be stuck with him for a while and that he would be the sole provider of medical care aboard the ship. The Doctor's first few weeks as a full-time medic on Voyager were not easy for him. He had no control over his activation subroutines, so anyone could activate or deactivate his program solely at their choice. Most of the crew considered him merely a computer program or a tool, and treated him accordingly. He, in turn, was curt and rude to them, lacking empathy and bedside manner, and he was unhappy that he was being used to perform menial medical tasks. He felt that his perfection and comparative medical genius were not appreciated. When developing or performing exceptional medical procedures, he often cynically remarked that anywhere else performing such kind of a procedure would have won him a prestigious award. 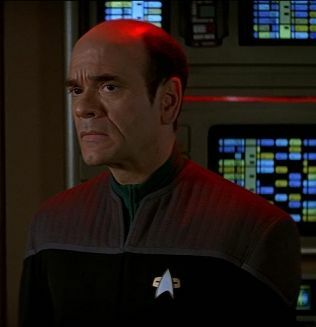 He was also upset at being the last one to be made aware of events that were not directly within his purview, such as the Maquis crew joining Voyager and both Neelix and Kes joining the crew. When Voyager was caught in a quantum singularity, The Doctor's imaging processor began to malfunction, causing him to shrink. This malfunction was eventually repaired. One of The Doctor's first major clinical achievements on board Voyager was creating a holographic lung for Neelix. Neelix had lost his lungs to Vidiians during an organ-harvesting raid. The Doctor devised a plan to use holographic lungs to keep Neelix alive. The Doctor's idea succeeded; however, Neelix was confined to an isotropic restraint and not allowed to move, as the holographic lungs could not move. The Doctor was later able to transplant one of Kes' lungs into Neelix, with help from the Vidiians. It was not until Kes volunteered to work with The Doctor as an assistant – and later medical student – that relations between The Doctor and most of the other crew members began to improve. It was Kes who first discovered the crew's disrespectful behavior toward The Doctor; she noticed that, just as with an item of equipment, they never addressed him directly, they barely listened to him, and often exited his presence without deactivating his program. Kes brought the matter to Captain Janeway's attention, asking that The Doctor be treated with greater respect and granted some interpersonal autonomy. Janeway took Kes's advice to heart – somewhat reluctantly, as she herself was aware of The Doctor's questionable bedside manner – but nonetheless granted him partial control over his activation and program. He was subsequently left hurt when it was revealed that the crew were exploring a means of transporting back to the Alpha Quadrant through a small wormhole, as he was the last one to know about this development and would be left on the ship as it was impossible to download his program at this time (although the matter became academic when it was revealed that the wormhole extended into the past). The same year, The Doctor diagnosed that Kes' sexual maturation, the elogium, had been prematurely activated by a swarm of space-dwelling aliens. During this period he acted in the role of Kes's father by performing the necessary rituals with her, such as the rolissisin, a ritual in which the feet are massaged until the tongue swells. Kes' elogium ended when Voyager cleared the aliens' territory. The Doctor hypothesized that the elogium had been prematurely triggered by the aliens and that Kes would still be able to conceive at her natural age of elogium. In 2372, The Doctor still didn't consider himself a true member of the Voyager crew. He felt he was not being kept sufficiently informed about ship business and missions. As a result, he was forced to repeatedly open communications channels all over the ship in order to find out what was going on, an activity Captain Janeway asked him to discontinue. In response to criticism that he was unsympathetic to his patients, he programmed himself with the Levodian flu for twenty-nine hours to simulate the effects and to prove that a little illness should not be grounds for a constantly whiny and cranky attitude, which he accused the Voyager crew of every time they entered sickbay. Thirty hours later the simulated flu still had not cleared him, and The Doctor became fearful, feeling helpless and not in control. Kes later admitted that she had extended the simulation unbeknownst to him to teach him a real-life lesson, as it would hardly have been a real illness if he had known the outcome. Despite initial irritations and frictions, The Doctor also experienced new things in the personal growth and romance department. When a Vidiian scientist named Danara Pel was beamed aboard Voyager to be treated, The Doctor transmitted her synaptic pathways into a hologram of her body without the disease and put her real body in stasis until he could find a cure for her breakdown. He grafted a piece of B'Elanna Torres' brain tissue onto Pel's brain, as Klingon DNA had been found to be resistant to the phage. Over time he became attracted to her, but as he was inexperienced in the matters of the heart, he did not know how to handle his new-found emotions and confess his feelings to Denara. After receiving some advice from crew members such as Kes and Tom Riker, he overcame his initial awkwardness and took Denara on a date on the holodeck. When a cure for her condition was found and The Doctor was finally able to take Denara out of stasis, she refused, stating that she did not want to go back to that deformed body. The Doctor assured her that he loved her no matter what she looked like and that he would not want her to give up her life. The Doctor was very thrilled when Denara elected to remain in Starfleet as his Assistant. When a transporter accident combined Tuvok and Neelix into a single entity named Tuvix, The Doctor found a way to separate and restore them. However, he refused to perform the procedure as he would have to kill Tuvix, a sentient being in his own right who had refused to consent to the separation. Captain Janeway eventually performed the procedure in his stead. When Voyager discovered a group of alien survivors trapped in a neural network by a deranged clown-like manifestation of their own fears, The Doctor was selected as the crew's 'negotiator' as he was the only person who could access the network without being trapped in it. Although he initially failed to reason with the Clown, he was eventually able to trick the Clown into releasing his current "hostages" by claiming that Janeway would take their place, the crew in reality providing a fake Janeway. The Doctor played an essential part in the defeat of the Kazon sect led by Seska and Culluh. After the crew was captured and marooned on a desolate planet, The Doctor – who escaped deletion by claiming that as a hologram he was neutral and thus did not care whether Kazon or Starfleet were in charge of Voyager – with the help of Lon Suder sabotaged the backup phaser couplings. This allowed Ro Laren and her Talaxian allies to retake the ship and save the crew. In 2373, The Doctor reached the limit of his memory capacity and started suffering massive memory loss. When an alien attack injured Paris, The Doctor was unable to treat him because his program was degrading and he was beginning to lose all of his medical knowledge. When it became evident that his program would disintegrate completely, another hologram, the Diagnostic Program Alpha-11, was used to find the source of the problem. It was discovered that the problem was in The Doctor's core programing, which had become severely fragmented because of constant use of the EMH over the course of the past two years. The maximum operation for the EMH was intended for around 1,500 hours (roughly two months). To further complicate matters, The Doctor's expansion of his original programming to include personality subroutines and interests in things such as opera, interpersonal relationships with the crew and engineering skills had filled all of his available memory buffers, leaving little room for his program to operate in its intended function. The captain was playing with the idea of reinitializing The Doctor's program, but that would have meant loss of all his memories and everything he had experienced over the past two years. Kes objected to just resetting him and asked the captain to try and find another solution. When no other options were found, Kes suggested overlaying the diagnostic program's programming matrix onto The Doctor's. This effectively deleted the Diagnostic program and integrated its core portions as a graft onto The Doctor's program. This procedure restored The Doctor but led to massive memory loss, including his recollection of the crews' identities and most events of the previous two years. Although some memories seemed to have survived, it was unclear if The Doctor would struggle to regain his hard-won personal skills. But some hope remained when Kes, after the reinitialization, observed The Doctor singing a song to himself; a song that was learned prior to the transfer of the Diagnostic program matrix onto his own. Later that year, he assisted in stopping Henry Starling's plan to steal a timeship which had accidentally traveled into the past, simultaneously acquiring a mobile emitter that permitted him movement beyond the limits of Voyager's sickbay and holodeck after Starling "stole" him from Voyager to question him about their presence in this timeline, transferring him into the mobile emitter to make it easier to threaten his existence. Having escaped Starling, the Doctor rescued Tom Riker and Torres from some survivalists, returned to Voyager and enjoyed his new-found freedom from sickbay, the emitter proving simple for the Doctor to use while also allowing him to be returned to sickbay. The Doctor was able to create a device to remove Ilari warlord Tieran's consciousness from Kes. He also helped Janeway rid Voyager of an attacking macrovirus when she returned from an away mission and the rest of the crew had been infected. In an attempt to improve himself further, The Doctor created EMH program 4C, adding personality subroutines to his holomatrix copied from many historical figures, including Lord Byron, Mahatma Gandhi, Socrates, Marie Curie, and T'Pau. Unfortunately, The Doctor didn't realize that even great historical figures had less desirable attributes and that all those, combined within his personality, would cause his program to destabilize. As a result, The Doctor began to develop a second, darker personality which exhibited callousness, anger and deceit. He attacked B'Elanna Torres, who was trying to fix his program, and rendered her immobile so she could not tell on him. He also attacked Zahir, an alien whom Kes had befriended, and kidnapped her, trying to arrange passage to another planet. Protective of and attracted to Kes, The Doctor attempted to kill Zahir, claiming that Kes's innocence required that he be there to protect her. After the failed escape attempt with Kes in tow, The Doctor was beamed back aboard Voyager, having finally lost the added subroutines and unable to remember his actions ever since the darkening in his personality had taken over. Despite such incidents, The Doctor nonetheless continued to expand his programming. In order to experience human family values, he once created a holodeck family, assuming the name of "Kenneth." Initially the program was idyllic, with a devoted, loyal wife who loved chores and serving her husband and obedient children who insisted doing their homework and fought over who would say goodbye to "Daddy" first when he left for work. The Doctor was pleased, but when he invited Kes and Torres over for dinner, Torres was more than annoyed with the "lollipops" - as she called them - The Doctor had created, stating that what he had created was in no way what a family life dynamic was like. With The Doctor's permission, Torres reprogrammed it to be more realistic. In the new simulation, his wife wasn't a devoted housewife looking forward to his bringing colleagues home for dinner and his children were rebellious, undisciplined and disobedient. The Doctor was mortified at the changes, as they were not at all what he had in mind when imagining his family. He even contemplated deactivating it permanently after his 'daughter' was fatally wounded in an accident and he could not take the pain that came with losing her. However, Tom Riker helped The Doctor learn to cope with the negatives as well as the positives in having a family, and The Doctor returned to the program to mourn the loss of his daughter with his wife and son. The Doctor proved instrumental in assisting the crew's escape after an alien race knows as the Nyrians commandeered Voyager and relocated the ship's entire crew into an artificial environment suitable for them. Chakotay, as the last crew member on board, transferred The Doctor's program into the mobile emitter before he could be deleted. Torres subsequently modified The Doctor's optical sensors, allowing him to "see" portals between artificial environments, and with the aid of another prisoner, named Jarlath, the crew reached the Nyrians' spaceship and retook Voyager.